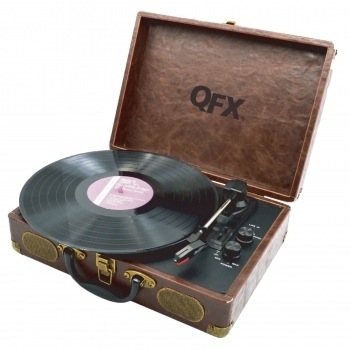 The QFX Suitcase Turntable spins your favorite 33, 45, and 78 rpm vinyl, producing warm, rich tones with the ceramic stereo cartridge and stylus-or stream your favorite Mp3s from any Bluetooth device! The whole system fits inside a vintage, faux-weathered suitcase with a built-in rechargeable battery for a retro style sure to "turn" heads. vintage-looking record players come in handmade wooden cabinets with handy suitcase-like closures and carrying handles. They're also wireless, incorporating modern Bluetooth technology so the unit can double as an mp3 player. Transform the tunes on any vinyl record into mp3 files using the included software. This way, you can enjoy the hisses and pops of your favorite records from the speakers of your mobile device. If you're looking to clear up space by thinning out your vinyl collection, this feature provides a great way to preserve the songs for posterity. Bluetooth technology works in tandem with the record player's built-in rechargeable battery to make this record player uniquely suited to travel. It even comes with a protective case and carrying handle so you can easily carry it from room to room. Integrated RCA outputs let you hook the record player up to your home stereo setup, where even your oldest, moldiest jazz bootlegs can reap the benefits of modern audio-enhancing technology.